Jake Brown Photo / Duluth FC players compete during an intrasquad scrimmage on June 13 in Ashland, Wisconsin. Duluth FC locked up second place in the NPSL North last weekend with a 1-0 win over Med City in the regular season finale, and qualified for the playoffs in the Midwest Region for the second straight year. As the fifth seed, the BlueGreens enter the postseason in the opening round and host sixth-seeded Grand Rapids FC on Saturday. Though they failed to defend the title in the end, the BlueGreens put together another strong season to finish runners up in the North this year, and became the first team from the conference to qualify for the playoffs in back-to-back seasons. If nothing else, they’ve proven to be consistent. 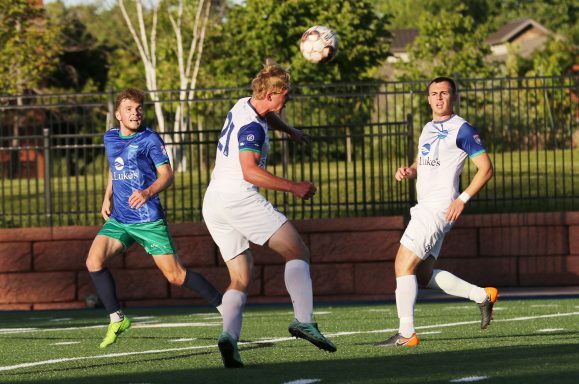 After a slow start to the NPSL season that saw the club draw four of its first five matches, Duluth caught fire in the second half, posting five clean sheets and winning six of its final seven under first-year head coach Joel Person. Duluth closed out the schedule with an 8-2-4 record in conference play, identical to the mark set last season. And while those same 28 points weren’t enough to keep pace with the title-winning Crows this time around, they were enough to get the BlueGreens back into the playoff picture. This level of consistency is difficult to maintain for any club, let alone one with U.S. Open Cup obligations to start the season. Clearly, one of the most important keys to the BlueGreens’ continued success has been roster depth. Having a deep bench certainly helps, but consistency also demands commitment, the kind of commitment from staff, coaches, and players that ensures a quality product is put out week after week, from year to year. Person will be hoping that investment pays off when Duluth hosts Grand Rapids FC, runner-up in the Great Lakes Conference, in the opening round of the Midwest Region playoffs Saturday. The club is looking for its first-ever playoff win after falling to Detroit City on the road in the Midwest semifinal last year, and Person certainly sees some upside in having one more home game to set the table for a potential semifinal matchup with the top-seeded and still unbeaten Crows. Of course, the BlueGreens remain focused firmly on Grand Rapids, a club that poses a real threat despite its squeaking into the postseason on the back of results in other matches. Two years ago, GRFC won the Great Lakes title and lost to the eventual NPSL champion AFC Cleveland in the Midwest final. The club also boasts one of the highest attendance figures in the league over the past few years, with over 2,000 fans coming out in support of the team each time out. But the Boys in Blue dropped points in three of their last five matches, and haven’t played a competitive match since June 29. Considering how both clubs finished the season, that the match will be played at Denfeld, and that Duluth has last year’s playoff experience to draw from, the BlueGreens look like the favorites coming into the match. Of course, anything is possible in the playoffs. “The playoff game we played last year because we got the bye in the first round was at Detroit City, in front of 7,000 fans all screaming and yelling the entire time,” Person said. “It was a really, really tough atmosphere to go in and play last year, and I think our performance reflected that a little bit. It was very uncomfortable for the guys, especially ones that hadn’t been in that type of environment before. Now, going into this year we have a very experienced portion of the team that was at that game last year, and so to go out and experience that atmosphere and what NPSL soccer is all about, how to handle all that, I think is going to pay huge dividends this weekend. The Midwest Regional quarterfinal match between Duluth FC and Grand Rapids FC gets underway Saturday at 7 p.m. The winner advances to face top-seeded Minneapolis City SC on July 20.